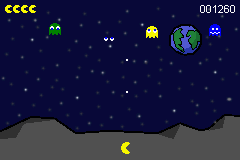 Space Commander Pac-Man is a mixture of Space Invaders and Pacman. There are 6 difficulty levels in the game based on the score. Each level adds a new ghost and new ghost behaviors.